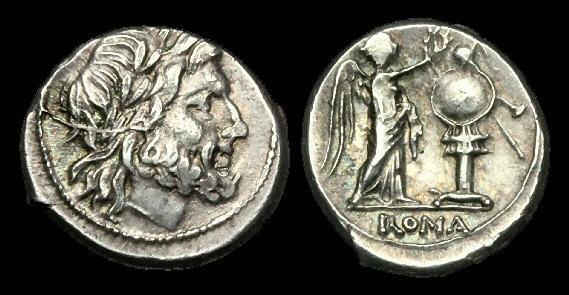 AR Victoriatus, ca.211-208BC, ca.17mm,	ca.3.4g. Laureate head of Jupiter right /	Victory standing right erecting trophy; ROMA in exergue. RSC Anonymous 9, Cr53/1, Syd 83. OR-FTUK - REPUBLIC - L. Calpurnius Piso L f Frugi, AE As, ca.90BC. RE-FDBD - REPUBLIC - C. Marcius Censorinus, AR Denarius, ca.88BC.